The Vine Vera Resveratrol Zinfandel Illuminating Pre-Mask is the ideal product to use to prep your face for the Resveratrol Zinfandel Illuminating Petal-Peel System. The Resveratrol Zinfandel Illuminating Pre-Mask contains oyster shell extract and vitamin C (as ascorbic acid). Oyster shell extract is a lavish ingredient that provides gentle exfoliation, which allows the Vine Vera Resveratrol Zinfandel Illuminating Petal-Peel System to cleanse your skin better. Vine Vera recommends using the Resveratrol Zinfandel Illuminating Pre-Mask once per week to remove dead skin cells from the skin’s surface and enhance the effectiveness of other Vine Vera skin care products. The Vine Vera Resveratrol Zinfandel Illuminating Petal-Peel System takes skin care to the next level and provides an entire skin care experience. The Resveratrol Zinfandel Illuminating Petal-Peel System contains six packets of Rose-veratrol Petal-Peel Powder, six packets of Activating Petal-Peel Gel and 10 Correcting Petal-Peel Capsules in addition a mixing bowl and spoon. Ingredients like rose bud powder, evening primrose oil, vitamins C and E and diatomite combine in the most elegant, indulgent face mask that reveals a radiant, illuminated and glowing look. The Vine Vera Resveratrol Zinfandel Skin Tone Correcting Serum has a luxurious, silky texture and a formula of the highest quality ingredients that target undesirable signs of aging. Formulated with vitamin C (as ascorbic acid), vitamin A (as retinyl palmitate), orange peel extract (citrus unshiu peel extract) and our anti-aging superstar resveratrol, the Resveratrol Zinfandel Skin Tone Correcting Serum aids your skin care regimen in its efforts to promote rapid cell turnover, in order to reveal younger and healthier skin. Licorice root extract in conjunction with vitamins A and C diminish the appearance of sun and age spots for a more even, radiant looking skin tone. Vine Vera recommends the Resveratrol Zinfandel Skin Tone Correcting Serum be used daily, and after using the Resveratrol Zinfandel Illuminating Petal-Peel System in order to achieve maximum results. 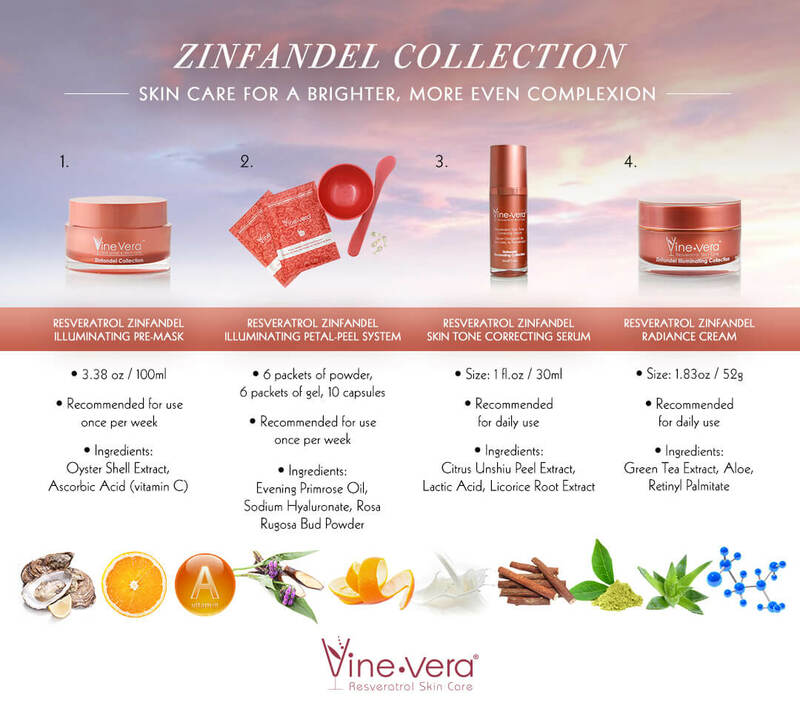 The unique Vine Vera Resveratrol Zinfandel Radiance Cream has a comforting cream texture and features premium ingredients that highlight the radiance of your skin while protecting it from further damage. The Resveratrol Zinfandel Radiance Cream uses derivatives of vitamin A (retinyl palmitate) which stimulates cell turnover and vitamin E (tocopherol) which provides your skin with smoothness and softness. Green tea extract (camellia sinensis leaf extract) both soothes skin, and along with resveratrol, provides superior antioxidant protection from harmful free radicals. An SPF of 30 blocks sun damage to prevent any future signs of aging. Vine Vera recommends using the Resveratrol Zinfandel Radiance Cream daily to feel maximum radiance and skin evenness results. The Vine Vera Zinfandel Collection features premium, innovative ingredients in immaculate formulas to provide unparalleled skin care products. Use the Vine Vera Zinfandel Collection to hide away visible signs of aging, reveal a more luminous look and provide a boost to your precious skin care regimen.